← Honestly, I Love Thor: Ragnarok! I’ve decided to give Gwenpool a try. I had very little use for that weird Gwen Stacy fetish that popped up a couple years ago, but all of the clippings I’ve seen of the Gwenpool comic have seemed pretty amazing. So the first tpb is on order! I’ll let you all know how it goes. Meanwhile, in regular comic land, it’s a pretty sad week. We must say goodbye to two of my favorites, Hawkeye and Iceman, the latter of which earns Comic Book of the Week! I’ll miss them both! Marvel’s Countdown to Infinity kicked off this week and I couldn’t care even a single iota. I didn’t read the issue and I keep skipping all these single page “Where is Wolverine” bits that show up at the end of comics. Just like Civil War II, this reeks of being a slapped-together event to tie into the upcoming Avengers: Infinity War movie. I don’t care. I do care about Kelly Thompson’s Rogue & Gambit mini-series, which remains awesome! I hope they keep her around the X-Men franchise! Comic Reviews: Amazing Spider-Man #797, Batman #42, Hawkeye #16, Iceman #11 and X-Men Red #2. Peter is with MJ, but when she’s reminded that he’s Spider-Man, she says they can’t fall back into old making out habits. So he leaves and catches a purse-snatcher, then goes to the Daily Bugle to check in with his people, and dodges a call from J. Jonah Jameson looking for information about the Goblin King for his blog. Meanwhile, Liz Allen asks Agent Anti-Venom to also track down the Goblin King, since he did steal from Alchemax. Where is the Goblin King? He’s rooting around in one of Norman Osborn’s old stashes looking for new goblin gear. Norman is there as well, interrogating a hidden prisoner for information on Spider-Man. Normal slays the Goblin King and then the prisoner lets slip some key information: Spider-Man is Peter Parker! Also, the prisoner is Jameson. So yeah, this is on me, but I had no idea that Norman Osborn didn’t know Spider-Man was Peter Parker. Obviously, way back at the start of Brand New Day, everybody was made to once again forget. And Norman has appeared plenty of time during Slott’s run on Amazing Spider-Man, including only a couple of months ago. But I dunno…I just forgot! So tying this issue’s big twist to Osborn learning the truth felt a little weird for me. Like…oh, okay…I guess that’s important. But it really only puts Osborn back at square one. He knew Peter was Spider-Man back before Brand New Day and menaced both of them plenty of times. So really, Slott is just catching Norman back up to where he was more than 10 years ago. That’s…not very menacing. Sorry. Not to mention the fact that it’s yet another issue of this big finale where Norman is basically just monologuing off on the side without directly engaging Spider-Man. The rest of the issue was fine and fun. The thing with MJ felt like a major tease, like Slott wanted to get in one last dig at anyone still hung up about One More Day. The bit with the purse snatcher was fun. I’ve already talked about how meh I feel about the death of Phil Urich. I hope Slott does more with that plotline in the next issue, considering he’s got both Peter Parker and Flash Thompson searching for Phil. Is that how everyone finds out about Norman? Maybe. We’ll see. This issue was fine and generally enjoyable. But, in some ways, it still feels like Slott is spinning his wheels ahead of his big finale storyline. All his attempts to hype up the new Red Goblin involve Norman talking menacingly and killing minor characters. Is there no bigger or more clever plan? 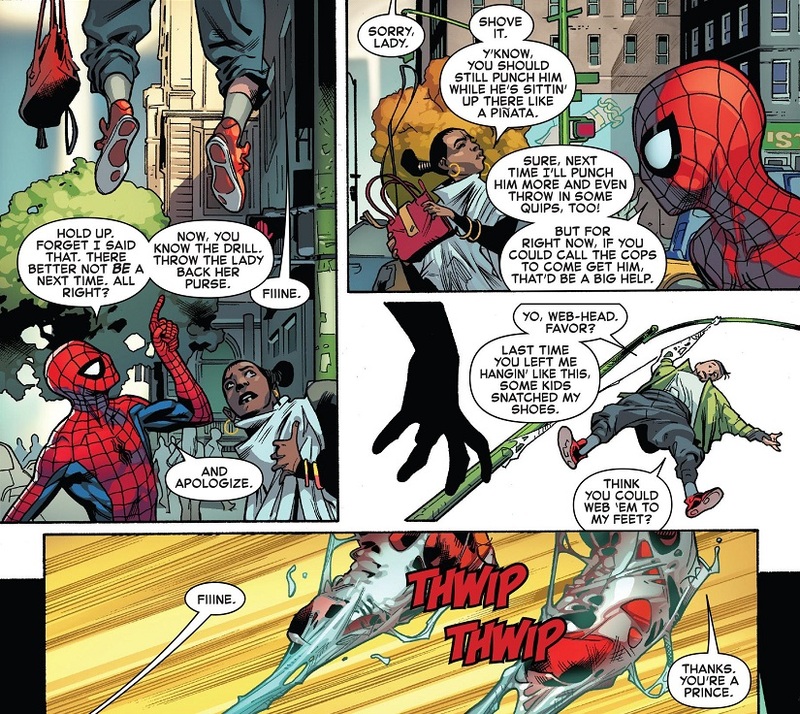 Getting Peter’s identity from Jameson falls a little flat since Jameson has only been part of Peter/Spidey’s life in Amazing for about two issues now. That was a Spectacular Spider-Man development, so it didn’t grow organically out of Slott’s storytelling. It just bugs me that we’re still only in build-up mode. When are we going to get to the fireworks factory?! TL;DR: Dan Slott continues to spin his wheels in his efforts to hype up his big finale, but it’s still an enjoyable enough comic. Another aspect I really like about Tom King’s Batman is his ability to get to the heart of the characters involved. This could have been just a Poison Ivy has an evil plot comic, but King makes it better! Poison Ivy has taken over the entire world, with all peoples everywhere under her spell — except for Batman and Catwoman, who took an antidote in time. Ivy has Superman hovering over Wayne Manor to make sure they don’t do anything too crazy, though she does let Batman and Catwoman go out into the city for burgers. 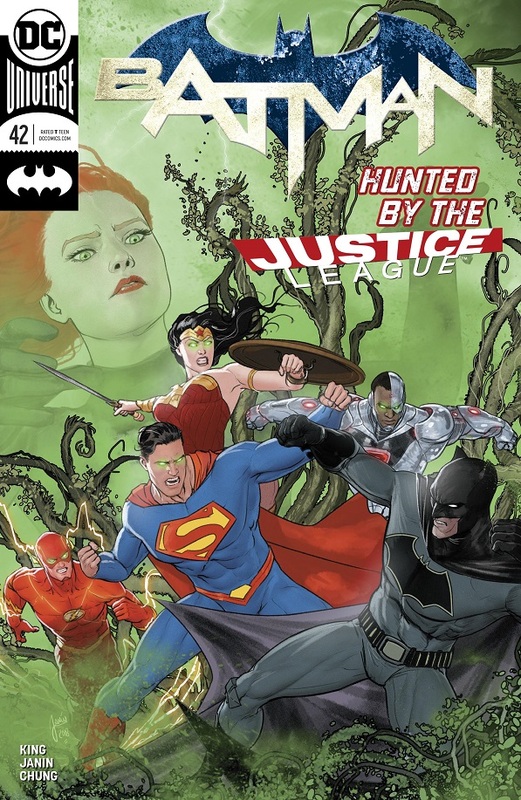 Batman goes to check on a specific house and takes out Superman and all the Flashes that Ivy sends after him, but the rest of the Justice League grab the duo and string them up. Once a prisoner, Batman begins to confront Ivy with the daunting responsibilities of her current plan. She allows her puppets to eat, which means there are plants being killed to sustain them. And what about the man that Bruce went to check on? He’s allergic to plants, so what’s Poison Ivy doing about him? If she’s not an evil villain, and is doing this just to protect the Earth, how does she account for all the harm that this plan is causing people? Batman gets her so riled up that Ivy snaps and has Superman punch Batman full-on in the face! Later, Catwoman has a face-to-face with Ivy to talk about how crazy her plan is while Batman is in a hospital recuperating from the punch. Ivy has sent Harley Quinn to take care of Batman. King takes this big Poison Ivy scheme and flips it on its head by making it more about Poison Ivy herself than about the heroes being superheroes. Batman’s solution, with Catwoman’s help, is to try and get into Ivy’s head to figure out why she’s doing this and to convince her that it’s a bad idea. She’s not a maniacal, cackling villain, and King is really playing with that in a fun and entertaining way. He peppers the issue with more fun moments, with Janin providing amazing art. 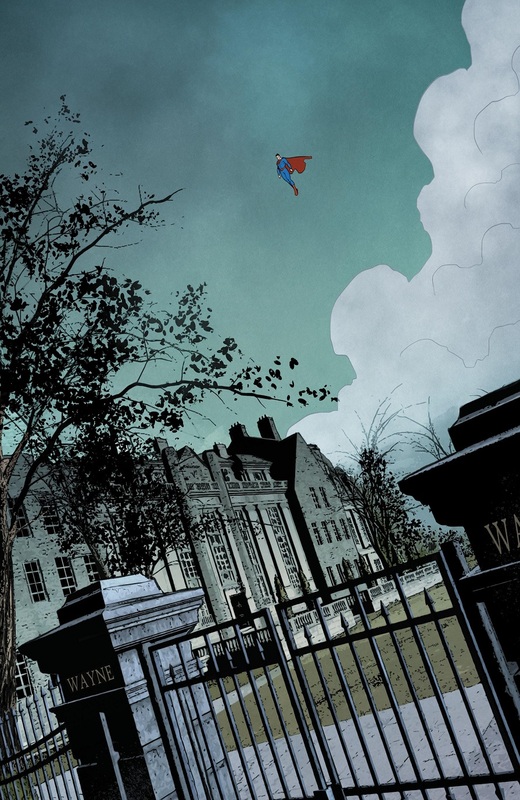 The opening page of Superman hovering over Wayne Manor is just perfect. It establishes everything you need to know with a single artistic image. And the focus on the characters continues throughout the issue. King has got such a great handle on all of them that the banter and dialogue is top notch. That’s what makes Tom King’s Batman so much fun. He takes a pretty standard supervillain plot story and elevates it to something truly awesome and enjoyable by diving deep into character motivation and interaction. Throw in a few clever bits here and there, and some enjoyable dialogue, along with the best art in comics, and you’ve got yourself a winning formula! TL;DR: Tom King dives deep into character studies in his ongoing Poison Ivy story, taking what could have been a standard villain tale and making it something truly special and enjoyable. 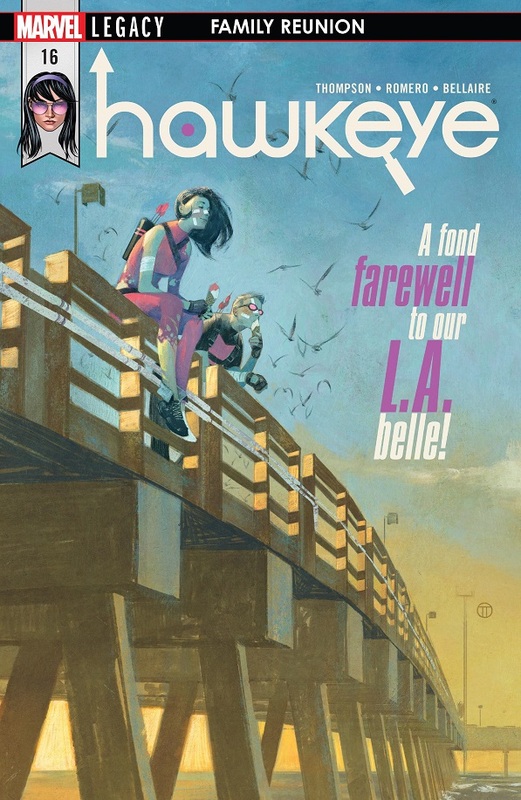 And so we bid a premature adieu to Kelly Thompson’s awesome Hawkeye comic! 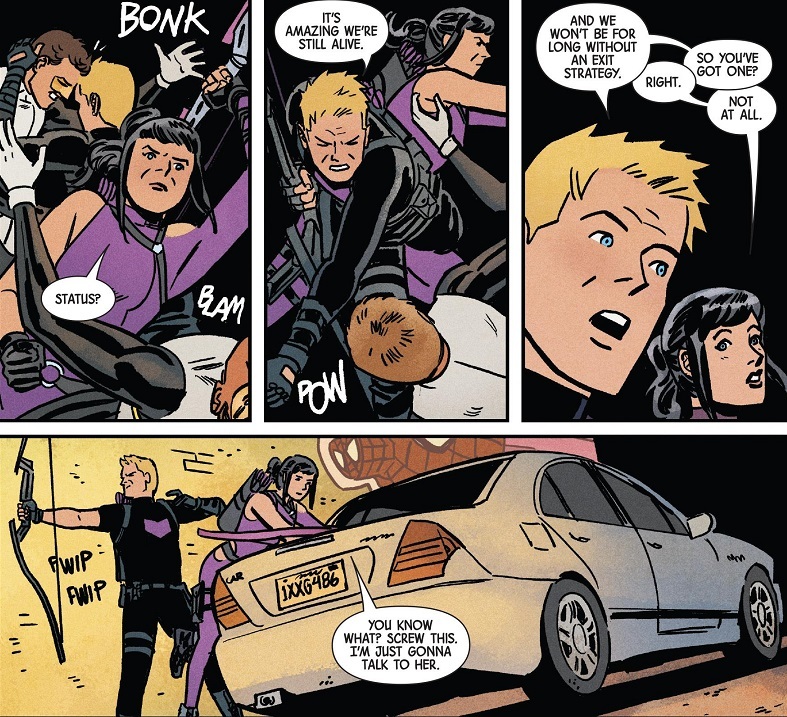 If you’re reading this, Kelly Thompson, I would say your Hawkeye was a worthy successor to Matt Fraction’s legendary run — at least his Kate Bishop parts! Kate and Clint do battle with Masque and Eden’s gathered forces, be they henchmen or time-plucked villains. Kate even frees her dad so that he can use his new persuasion powers to help out, and he mostly does, but he escapes in the end. Also, that boy that Kate liked, whose name escapes me, randomly has rock powers. That’s thrown in there. Anyway, Kate eventually decides to just try talking to Eden, convincing the grieving woman that this madness isn’t what she wants. Clint offers to surrender himself to Eden, but she can’t bring herself to pull the trigger, even with Masque goading her on. In the end, Eden surrenders and she uses her powers to bring her daughter through time (temporarily) so that she can say one last wonderful goodbye. Kate’s friends show up for a big group in-joke laugh. And we learn that Masque was working for Kate’s mom! Who isn’t dead! I feel like I’m being a bit too hard on this issue’s score. It was a fun comic, because of course it was. That is never in doubt when you’re reading Thompson’s Hawkeye. But I just don’t think this final issue reached any grand level of brilliance. It was a perfectly enjoyable finale, with a big fight scene and a big emotional ending — though all the emotion belonged to Eden, a villain I never truly understood, possibly because I never read that random spin-off comic where she debuted. I would have liked if Kate got the big emotional ending, or that it had focused more on Kate. But I suppose Kate giving the villain a stern talking to will have to do. At least she gets to keep having the best dialogue throughout the issue. A big fight against henchmen was an OK way to end the series. Obviously, Thompson didn’t have room to get to everything she wanted to do, like that dude with the rock powers, and all of Kate’s supporting cast, who show up at the end so Kate can promise they will always be her best friends (and I doubt we’ll ever see them again). I would have liked a bit more focus on Kate and what everything means for her. 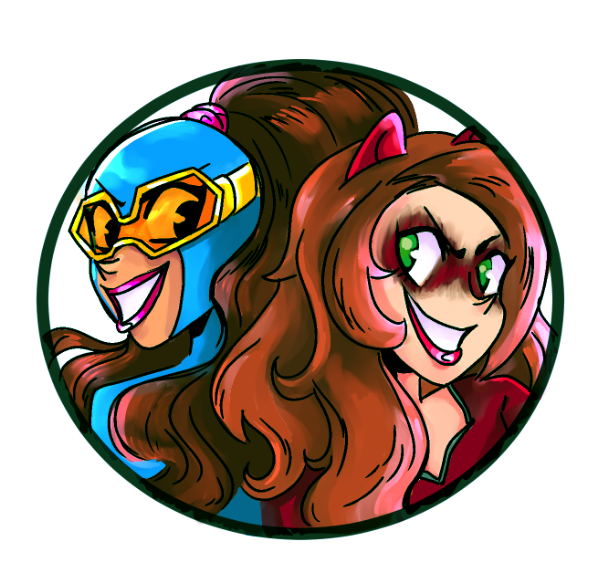 Fighting time-displaced versions of Boomerang and Lady Bullseye means nothing. And Kate doesn’t even get a showdown with her dad or Madame Masque. So I don’t think the issue packed as much of a wallop as it could have, but like I said, it was still a fine, enjoyable comic. TL;DR: Hawkeye goes out with a big fight that, while entertaining, doesn’t leave enough room for any greater summation of theme or emotional investment. And so we bid a premature adieu to Sina Grace’s awesome Iceman comic! I really liked this one, so it’s a shame we’re losing it, too. But such is comics. After being offered a leadership role on his own X-team, Bobby meets Rictor for lunch to get his thoughts on the matter. Lunch is interrupted by a call from Bobby’s parents, who want his help with a reclusive neighbor. The neighbor is violently anti-mutant, but psionic mutant power manifestations have been pouring out of his house. 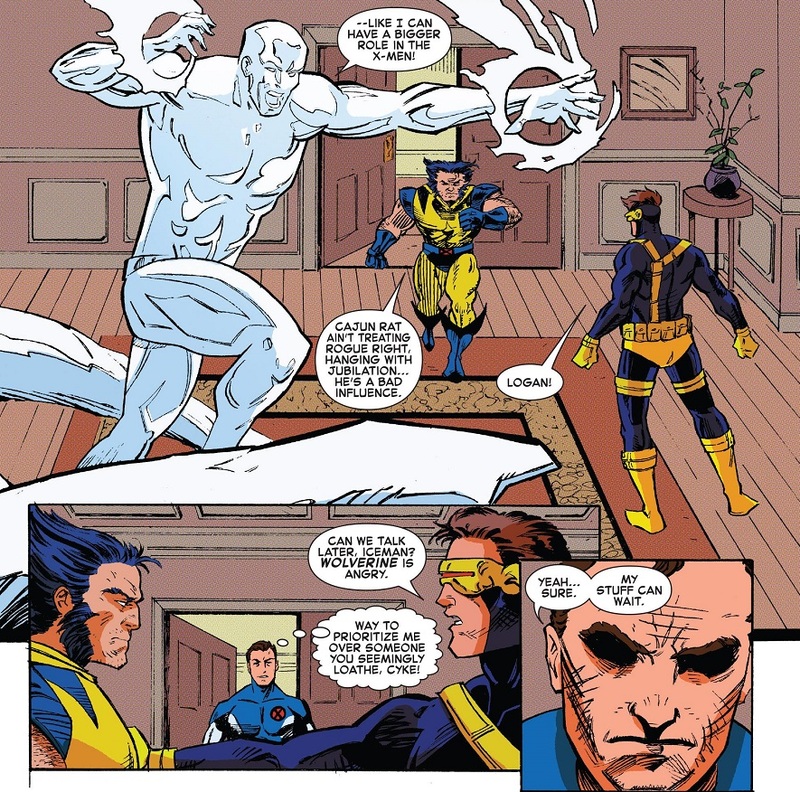 Iceman and Rictor head inside, with Rictor holding off the manifestations while Bobby reaches out to the guy to talk and convince him that it’s totally OK to be a mutant and that the X-Men can help him. It works! And some olive branches are extended between Bobby and his dad. Also, the issue is intercut with various flashbacks to Bobby’s youth and time with the X-Men, to moments when his thoughts about being a mutant and being gay got shuffled into the background by other people. Not to compare the two too closely, but I felt this was a stronger finale than the Hawkeye comic. Grace doesn’t have a storyline to wrap up, so he gets a whole issue of introspection, where he can underline themes from his comic and from his main character, and wrap everything up with a nice bow. He makes Bobby comfortable with his mutantness and with being gay. He starts the healing process for Bobby and his parents. He adds a Rictor cameo so that he can say the Iceman comic did feature guest appearances from other LGBTQ+ X-Men. Grace does a solid job with all of that — though I would have also enjoyed an issue of Bobby trying and likely failing to put together his own X-Team. That just sounds fun. Though flashbacks were neat, too. It stinks that the series is getting cut short, but I think it accomplished everything it needed to accomplish. Iceman had some fun adventures, there was a lot of positive attitude abound. Iceman got into some cool superhero fights. There was that mini original Champions reunion that I really enjoyed. 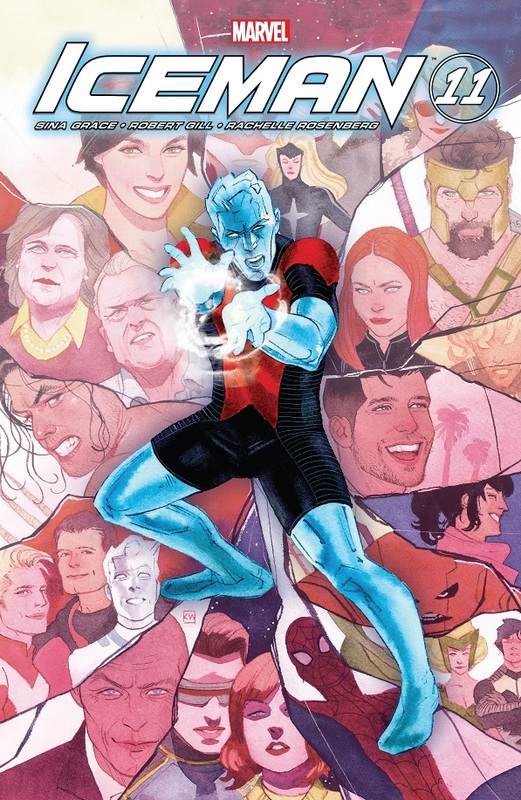 And this issue does a fine job of putting Iceman in a strong, positive place in the world. That’s got to count for something in comics. TL;DR: Iceman goes out with a solid, done-in-one issue that does a fine job of underlining themes and character growth. The best you can hope for when your comic is cut a little short. Is this it? Is this all you can conjure, Tom Taylor? Jean Grey, Wolverine, Honey Badger and Nightcrawler are seeking asylum in Wakanda after it was made to look like Jean killed the UK ambassador — which has sparked anti-mutant protests across the globe. Meanwhile, a new mutant, Trinary, gets word to Jean Grey that she has been arrested in her home country of India. Trinary is a technopath who used her powers to even out the gender wage gap in India, so her government put her in a cell. Jean’s squad bust in and rescue Trinary, and the Indian security forces call a Sentinel on them. Really? A Sentinel? That’s your big cliffhanger ending? This issue is even more frustrating than the first one because I know Tom Taylor can do better. He’s Tom freakin’ Taylor! He’s 30+ issues deep on a Wolverine comic that completely justifies keeping Wolverine dead forever! How is this his signature X-Men comic? 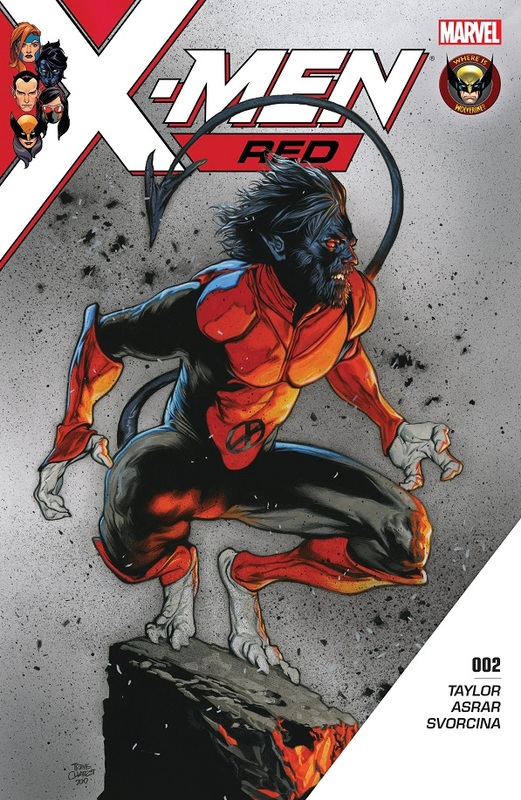 X-Men Red is painfully uninspiring. For this, Marvel resurrected Jean Grey? Is this really the best Taylor could come up with? Don’t get me wrong, the issue is competently made. It flows nicely, the dialogue is fun, Honey Badger is working overtime to make sure she’s the breakout character in a second comic, and Asrar on art is phenomenal. This is a very well made comic book. The creative team is worthy of Marvel launching a third ongoing X-Men series. But the story is just so bland! So there’s the same old anti-mutant hysteria and violence that’s always been around? Yawn. Rather than go ahead with Jean Grey’s big pro-mutant plans from the first issue, you’ve turned her and a handful of random X-characters into fugitives on the run? Isn’t that the premise of half the X-Force relaunches? And does it really work in the context of the larger X-Men comics right now? So the world has turned against these four mutants specifically, even though three of them were simply standing near Jean Grey when the trouble went down? And all other X-teams get to continue on like nothing is wrong? And then the bulk of this issue is spent introducing and then rescuing Trinary, who so far doesn’t seem worth the effort. 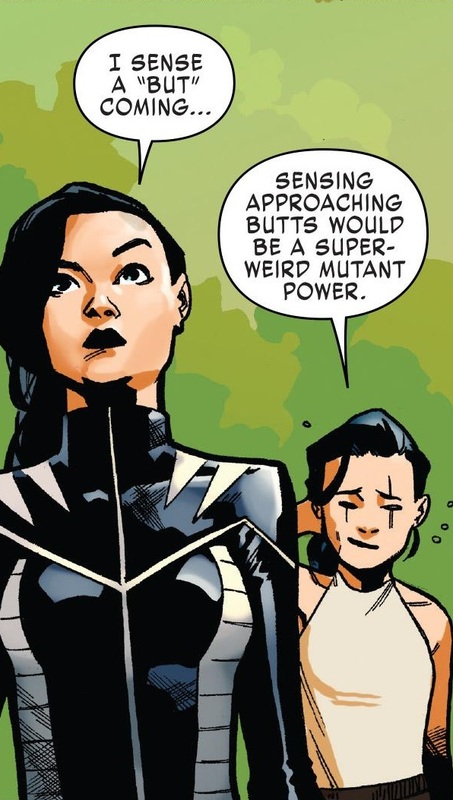 So a random mutant woman in India with a seemingly ordinary power? That’s the character important enough to hijack the second issue? And it’s not like she’s being held by anyone special. These four mutants could break into a secret prison cell in their sleep, and they practically do! It’s an action scene with zero stakes, and then the big cliffhanger is to call in a Sentinel? Seriously? Against these four mutants? Oh man, I wonder if Wolverine and Electric Boogaloo Wolverine are gonna be OK against a Sentinel. I’m sorry, I didn’t want to be mean to Gabby like that. She’s awesome. That teasing nickname just came to me. TL;DR: The second issue of this new series disappoints in its bland story choices, despite doing everything else right. Posted on March 10, 2018, in Batman, Comics, DC, Marvel, Spider-Man, X-Men and tagged Amazing Spider-Man, Catwoman, Goblin King, Hawkeye, Honey Badger, Iceman, Jean Grey, Kate Bishop, Phil Urich, Poison Ivy, Wolverine, X-Men: Red. Bookmark the permalink. 5 Comments. That’s an interesting way of writing “she was arrested for stealing money”, regardless of what the money is being used for is still stealing, a person who robs a bank who refused them a loan to save a child is still robbing it, even if their motives are sympathetic they are commiting a crime and can be arrested for it. And Gwenpool is actually pretty damn good, I didn’t expected much of it but they actually put some thought into it to make it entertaining first, a story with a point, and not just jump into the Gwen bandwagon. And thank you for the Gwenpool endorsement! Glad to hear I’m making the right call. 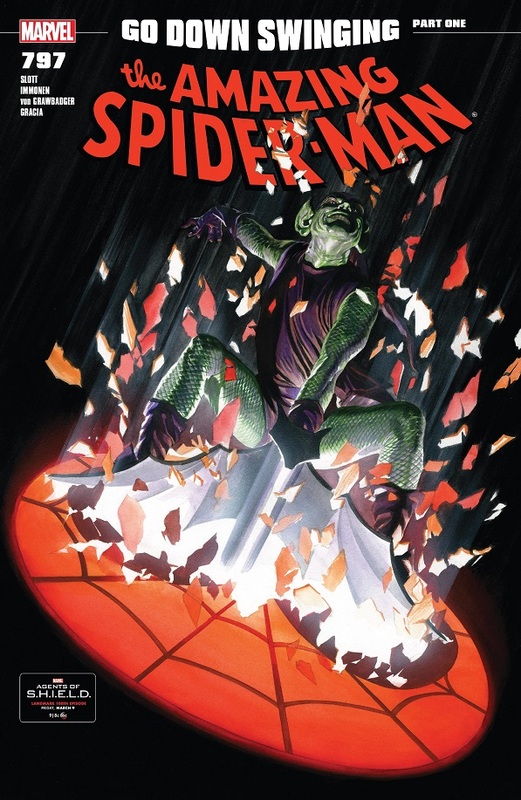 ASM has Slott’s run still not over. Hawkeye was a great finale to a great series. I am very excited to see what Thompson does with Kate next. 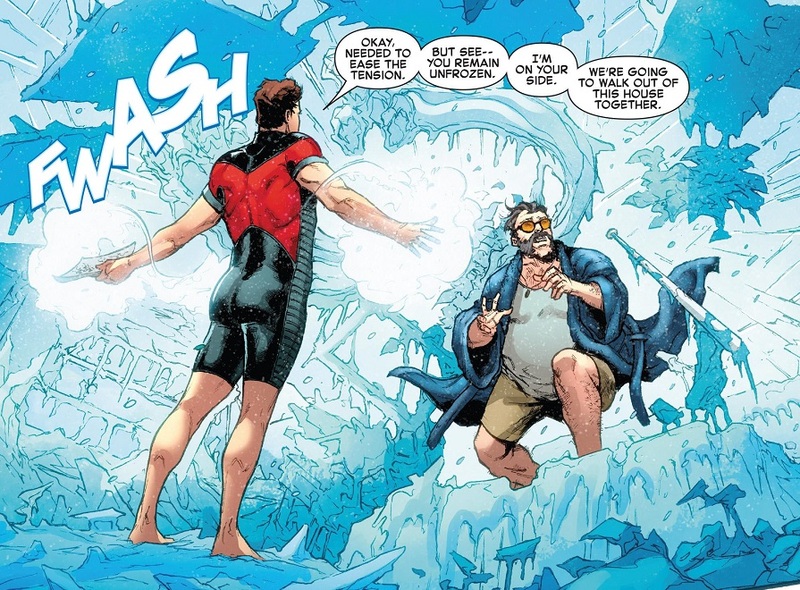 Iceman was a solid finale. But I’ve never really cared about the series. It’s Iceman, I just can’t care. I liked X-Men Red. I thought it was fun. The infiltration was cool. Also, the lady journalist thinking there’s more to the story was very much appreciated. I’m definitely on board to see where the story goes. Rogue & Gambit is also great. Loads of fun. I definitely can’t disagree that X-Men Red isn’t fun. It’s just…I dunno. It’s doing nothing for me beyond that and I really hoped it would. It’s also entirely possible that I’m judging a comic for what I wish it was instead of what it actually is. And I’m probably judging Red for what I’m hoping it’ll become.